Lucy talking to her plants, praises Agnes for growing so well and scolds Melvin for looking so poorly. She makes another distasteful health drink, "The Energizer", for breakfast. As the kids leave for school, they dump their portion into the dying plant which Lucy has named Melvin. As each family member leaves for work, they all dump their drinks into the plant. When they return home, they've found the plant has grown twice its size. They relize that it was Lucy's concoction for breakfast and Curtis decides to market it as "GigantaGrow", and immediately schedules a Press Conference. Lucy cannot remember which ingredients were used to create the drink. She tries the recipe numerous times with the family as guinie pigs, but can't get it right. As they get her to recreate the steps from the previous morning, Lucy remembers it was Beet Juice. 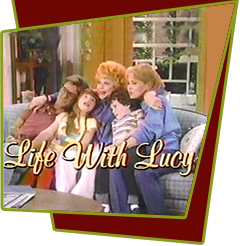 During the Press Conference, as Lucy is surrounded by her family, Melvin starts losing his leaves and wilts. The press and the people leave and they are all left with gallons of the stuff. Special Notes: This would have aired December 6, 1986.